After a long day crossing the length of Lake Kivu by speed boat, we reunited with our drivers and headed for Rwanda's newest 5-star luxury accommodation. Upon arrival, we were immediately greeted with hot towels to clean our hands, and cold, non-alcoholic caipirinhas to refresh ourselves. 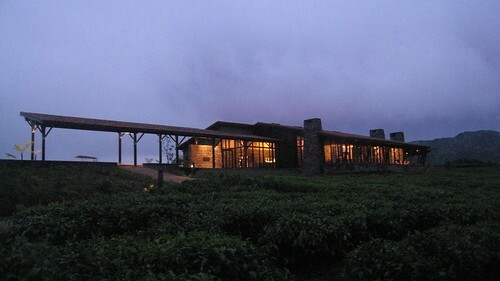 Set amidst a working tea plantation, on the edge of Nyungwe National Park, the Nyungwe Forest Lodge had just opened for business (in March 2010), and we had the privilege of being its first overnight guests. The complex boasts 24 luxury rooms, each of which includes a private balcony overlooking the forest. Monkey sightings are frequent, as the park is home to 13 different species of primates, including Black and White Colobus monkeys, and the feisty Chimpanzee. This building houses 2 of the 24 villas on the property. My room featured twin beds, while 15 others, and both suites, have king size beds. The fresh bedding itself, including sheets, comforter, and pillows, were as comfy and cozy as a traveler could require. 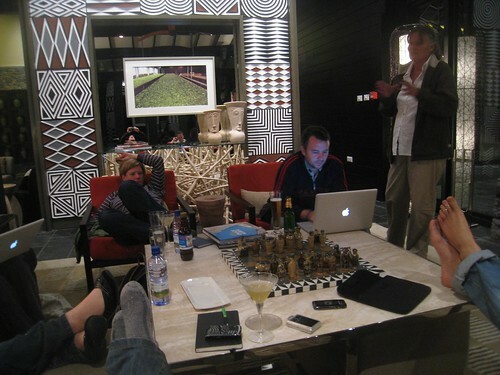 The interior design, including a wood-burning fireplace, felt befitting of a central African forest lodge. The room was immaculate. 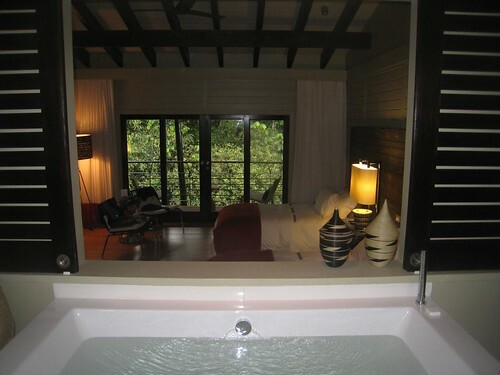 My favorite part of the villa was the bathroom, which featured a modern design, and a large bathtub overlooking the room. On my second day, after an unsuccessful attempt at chimpanzee tracking, I filled the tub with hot water, dimmed the lights, turned on some quiet music, and sunk into the hot water with a towel over my eyes. I wondered why it'd been years since I'd last taken a bath, but then again, I rarely encounter a bathroom that begs to be enjoyed so much. I also tried the shower, which included a small window that could be opened to let a little fresh air filter in. 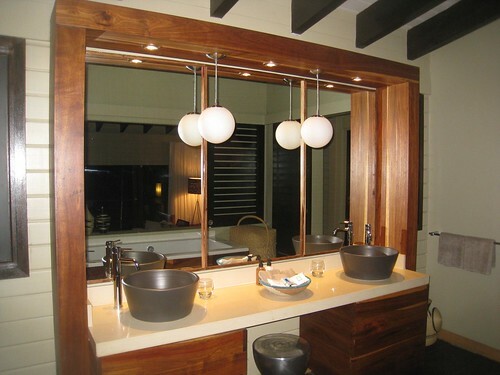 A bidet accompanied the toilet, and there were two large stone sinks atop the vanity counter. The main lodge with restaurant, and lots of cozy fireplaces. All of the buildings were low in profile and designed to compliment the natural environment. The gang unwinds around a fire after a long day. We spent most of our time together by one of several fireplaces in the main lodge. It was the perfect setting to enjoy a pre-dinner cocktail and catch up on the day's activities. I will share the food offerings in a future post. In the meantime, you can see additional photos from the property in the slideshow below. 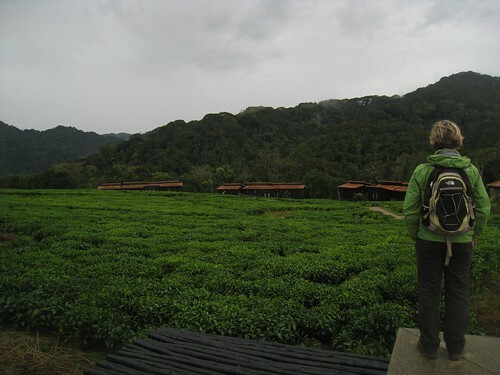 A luxury room at Nyungwe Forest Lodge will run you $400 per person. A suite costs $500 per person, and there is a single supplement of $200. Prices include breakfast, dinner with select beverages, and taxes. 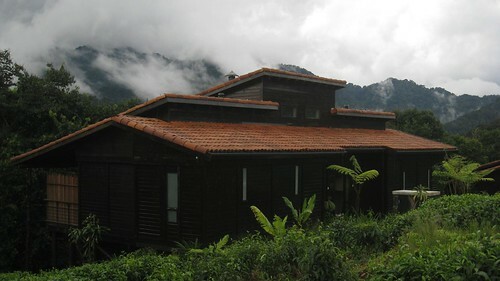 Splurge is the right word — the most expensive room I had on my trip around the world was in Laos, at $40 a night, or 10 times less than a night of luxury at Nyungwe! That said, it’s a beautiful setting, and lodge, with great service and excellent food. This resort is truly unique, i love how you take a speed boat to reach it. I'm definitely going to suggest this to my clients.